The Checklist template can be used by authors' as a summary of content that has preceded it. It could also be used as a checklist of possible items you'd need to pack on a business trip, or ingredients for a recipe. As a learner I'm expected to check each item off by clicking it with my mouse (or tapping it with my finger). I must check each item off in order, I can only check an item until the preceding item is checked. Checked items are indicated by a visible checkmark. As one item is checked off, the text for the next item will no longer be transparent until all items are checked. 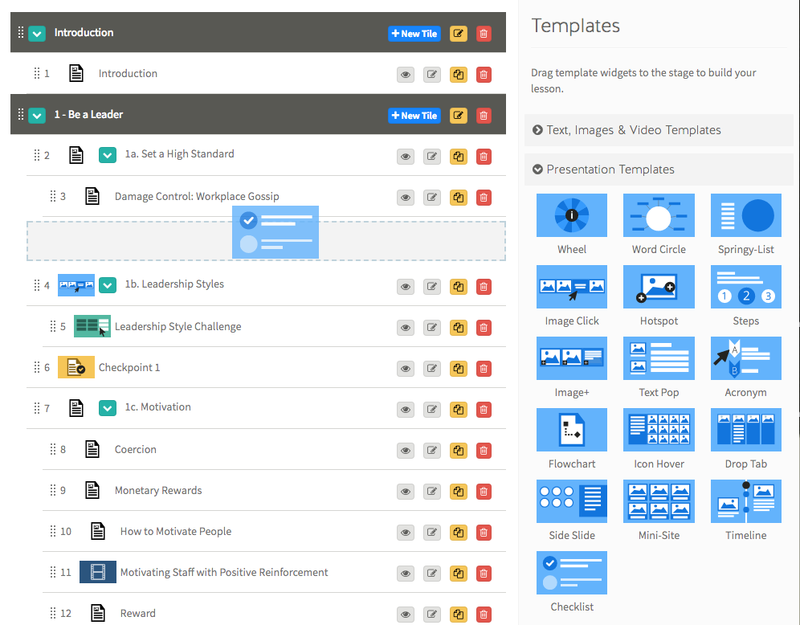 Step 1: From within the lesson overview screen, select the presentation templates panel to reveal the Checklist template icon. Step 2: Drag the Checklist Template icon into the Lesson Pathway. Step 3: Give your new tile a title. When you're done, click the green checkmark to save. Step 4: To get to the template edit screen, simply click the little edit icon button next to your new tile. 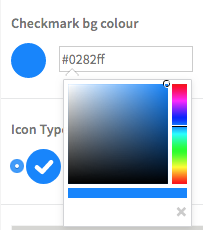 Step 6: You can optionally change the background colour of your checkmark. Simply click into the input box and a colour selector will be available for you to change the colour. 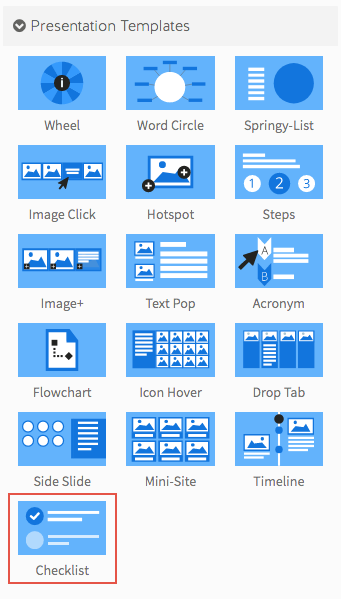 Step 7: Choose between 3 icon types for your checkmark; tick, square, or cross. 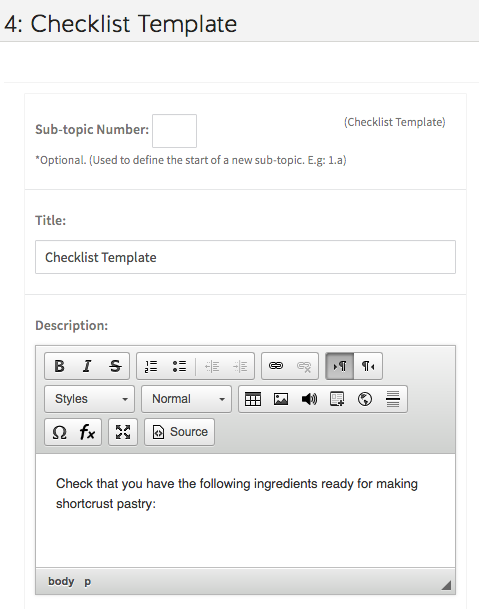 Step 8: To start adding checklist items simply click into the first empty checklist item and start typing. Click the blue check button once you're done to save your changes. Click the 'Add Another' button to add another checklist item. Use the drag handles to re-order checklist items. 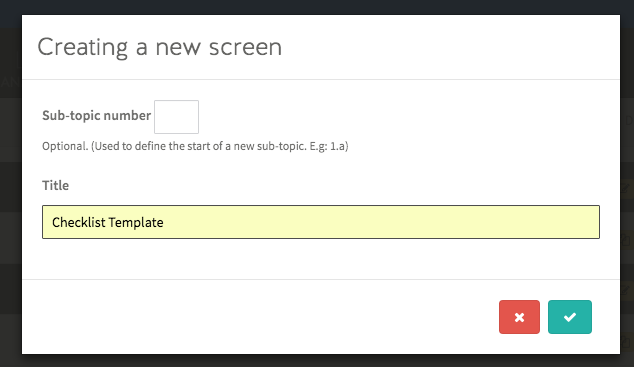 Step 9: Once you're done, click the preview button to preview your template.